CM385: Multimedia Publishing and Production | MICHAEL D. DWYER - Media. Cultural Studies. Writing. New tools in research and writing haven’t only changed the way that individual media forms (film, recording, newspapers, television) operate, it has also influenced the ways that those forms interact with one another. Technological developments, shifting market pressures, and changing cultural behaviors have created a situation in which writers are never *just* writers—they are always already designers and photographers. Filmmakers don’t just capture moving images, they also promote their projects, and showcase their visual style, through social media. Comedians don’t just tell jokes, they also create podcasts and web platforms to showcase their humor. Newspapers and magazines aren’t just newspapers and magazines—they’re mobile apps, digital platforms, and multi-media organizations. This class will explore these dynamics by engaging with contemporary multimedia texts produced by the types of outlets that were, until recently, strictly newspapers and magazines. In addition, students will practice telling non-fiction stories (be they journalistic, literary, critical or documentary) in multiple media forms, both as individuals and as teams. Finally, students will get the opportunity to speak with working professionals in contemporary media (video producers, magazine editors, web developers, social media journalists and feature writers) to get a better sense of what the current media landscape looks like at the ground level. The individual story, gallery, audio package and video segments (7.5% each) are short, single-author pieces that are inspired by a subject of your choosing. You can choose to tell the same story across these different media forms, or expand the story with each medium. These assignments are designed to give you some basic, introductory competencies using different storytelling methodologies. Each assignment will be accompanied by in-class critiques. 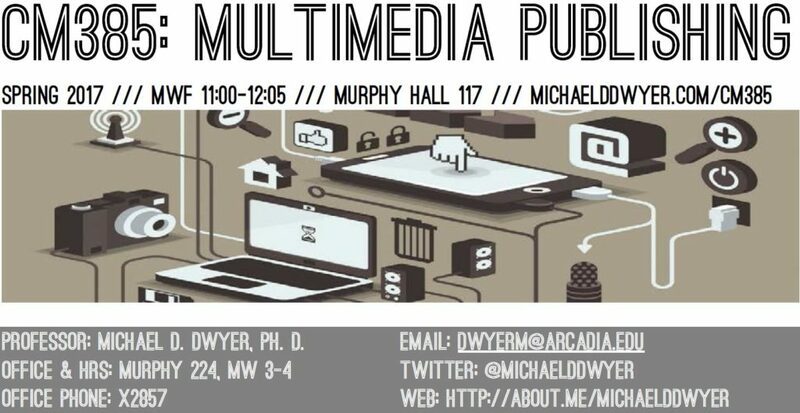 The multimedia consumption journal is a semester-long log of the stories, essays, news reports, podcasts, and multimedia features that you consume over the course of the semester, and write brief blog responses to. This assignment is designed to establish enriching habits of media consumption, as well as inspire you for your individual and collaborative projects. Over the course of the semester, you should write at least 7500 words of your own in response to ~50,000 words of online essays, multimedia features, or podcasts, and post it to your Medium or WordPress pages. You can find a list of appropriate essays I’ve compiled at http://www.michaelddwyer.com/essays. The collaborative multimedia feature will be a large feature story that will integrate research, writing, audio, video, and graphic elements in the telling of a large story. The purpose of this assignment is to expose you to the processes of pitching, developing, organizing, managing and producing a multimedia project in a team, with a hard and fast deadline. This feature, as well as the class’ selection of individually-produced materials, will be collected and published on a class-produced platform.